Providing them somewhere safe to retreat to, playing some music or TV to provide background noise (not too loudly), draw the curtains/blinds and most importantly seek veterinary attention or advise beforehand if your pet is nervous or has displayed anxiety towards fireworks or loud noises. Prevention of stress is much easier than treating the symptoms. Make sure that food is not left unattended at BBQ functions. Pets can become very unwell if they gain access to leftovers or rubbish bags containing leftovers. Don’t leave food on the front edge of the bench or on low tables. We’ve seen dogs grab fully wrapped turkeys, eat all the turkey meat and the plastic wrap! In these cases, the wrapping is as big a concern as anything else. Festive food treats are not necessarily treats for pets. Ham is very salty and fatty, chocolate is toxic and like with us, too much of anything is not good. Don’t give your pet the left-over bones from the roast as cooked bones fracture and can block the intestinal tract. Choose safe gifts for your pets. Be careful with placing Christmas decorations at “pet height”. We know they are inedible, but a surprising number of pets don’t. Don’t leave food gifts under the tree. We can’t see what they are, but animals don’t need to see to smell what is inside. 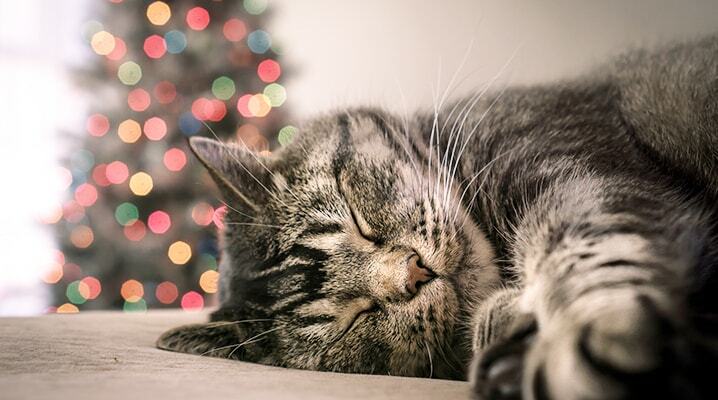 IF you are spending Christmas day away from home, make sure your pets are in a secure place with plenty of shelter and water. Be sure water bowls can’t be accidentally knocked over. Never leave your pets in your car, even on a mild day. When planning to walk your dog, be sure the footpath is not too hot for their paws. You should be able to leave your hand on the concrete for 5 seconds without any discomfort. If you feel discomfort, the path is too hot. Protect your pets from heat stress and avoid long walks or extensive playing, even on mild days, especially if your dog is not used to it. Ensure your pets always have access to water and if you can, bring them inside on hot days. Be sure your gates and doors are secured to ensure your pets aren’t accidentally let out by your guests. Keep your dog on a lead around waterways and bushy over-growth to protect them from snakes. Most importantly – if in doubt, call us for advice. We’re always happy to help any time, day or night.